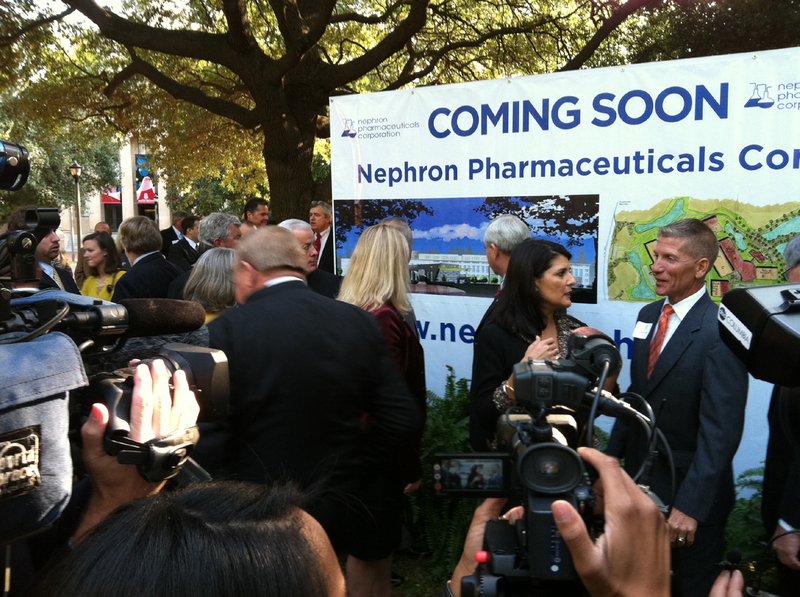 COLUMBIA, S.C. – October 28, 2011 – Nephron Pharmaceuticals Corporation today announced that the company will locate its new operations in Lexington County. The $313 million investment is expected to generate 707 new jobs. “We are excited to expand our company by locating our new manufacturing facility in Lexington County. This is a big step for our firm and will help us meet increased demand, expand our market share and develop our pipeline of products. South Carolina has an excellent business environment and we look forward to our expansion into the Palmetto State,” said Lou Kennedy, CEO of Nephron Pharmaceuticals Corporation. 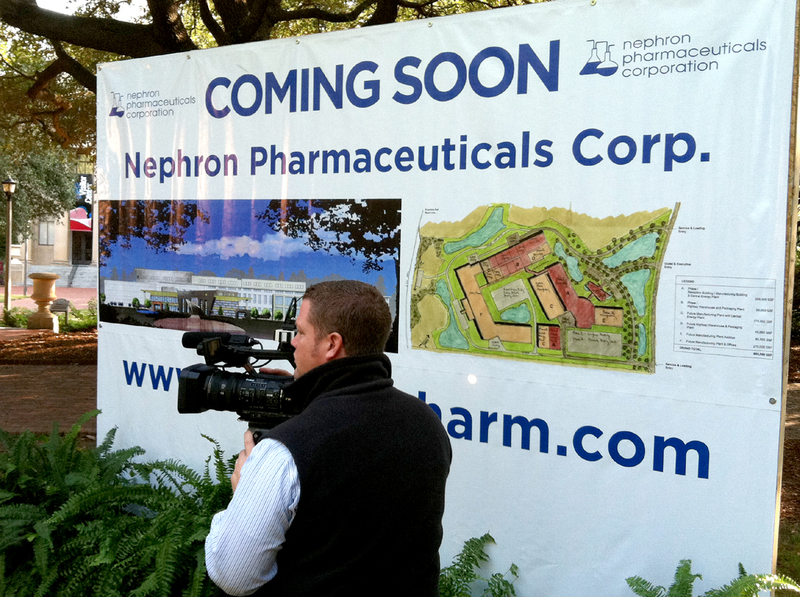 Nephron Pharmaceuticals Corporation will establish a new pharmaceutical manufacturing campus and offices in Lexington County. The company is based in Orlando where it currently operates 250,000 square feet of manufacturing, distribution and packaging facilities. Additionally, the company has distribution centers in Kentucky and Arizona. 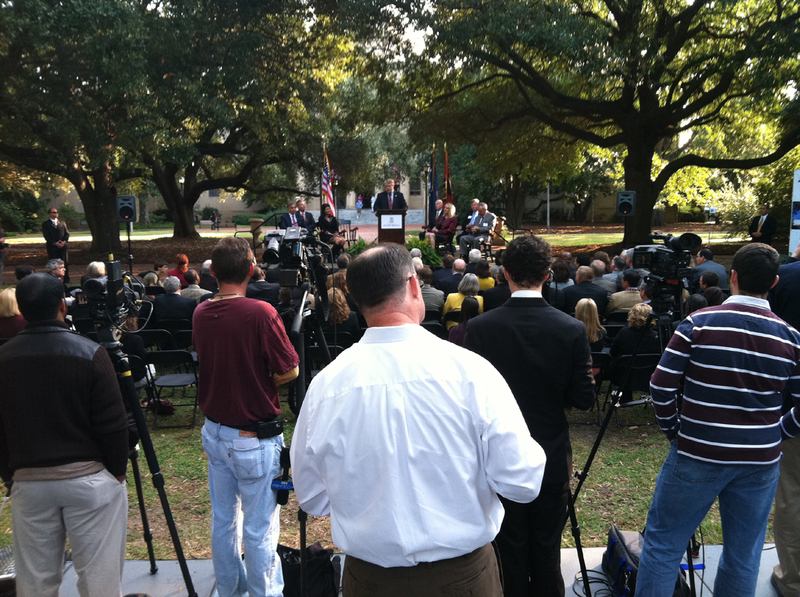 “It’s another great day in South Carolina with today’s announcement. We celebrate Nephron Pharmaceuticals’ decision to locate its new manufacturing facility in the Midlands and create hundreds of well-paying new jobs. This is a big win for our state,” said Gov. Nikki Haley. In June, William and Lou Kennedy were awarded the Order of the Palmetto for their philanthropy in founding the Kennedy School of Pharmacy at the University of South Carolina. Both are South Carolinians and alumni of the University of South Carolina. 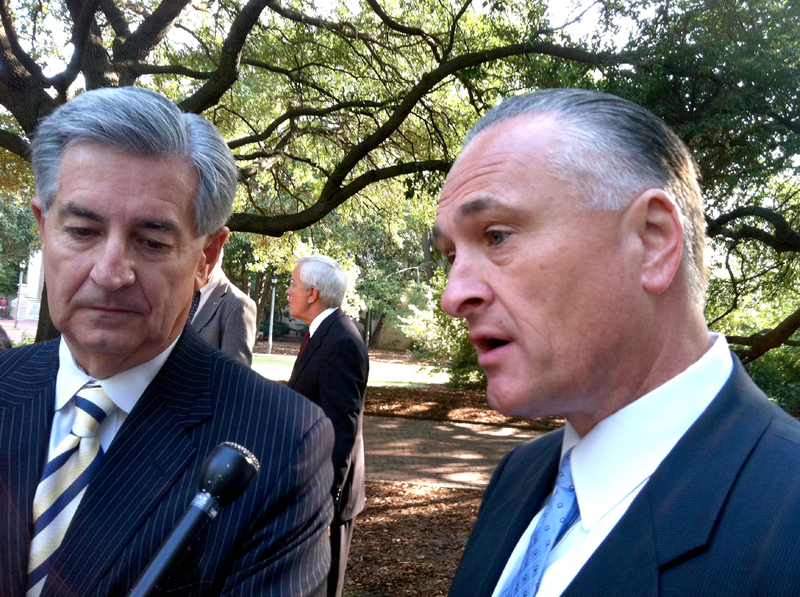 Discussions between the Governor and the Kennedys during the Order of the Palmetto visit led the company to consider South Carolina for the new facility. “I am gratified that Lou and Bill Kennedy, who have already established the Kennedy Pharmacy Innovation Center at Innovista, see the University of South Carolina and our state as locations to further their commitment to pharmaceutical manufacturing with world class quality and efficiency. 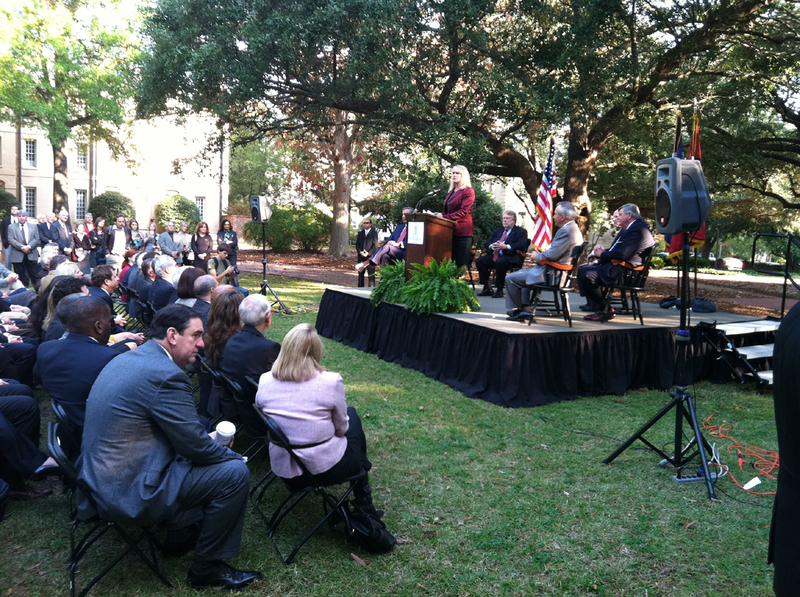 Their vision and keen business acumen have led to an important second step in increasing innovation and the knowledge economy in South Carolina,” said Dr. Harris Pastides, USC president. 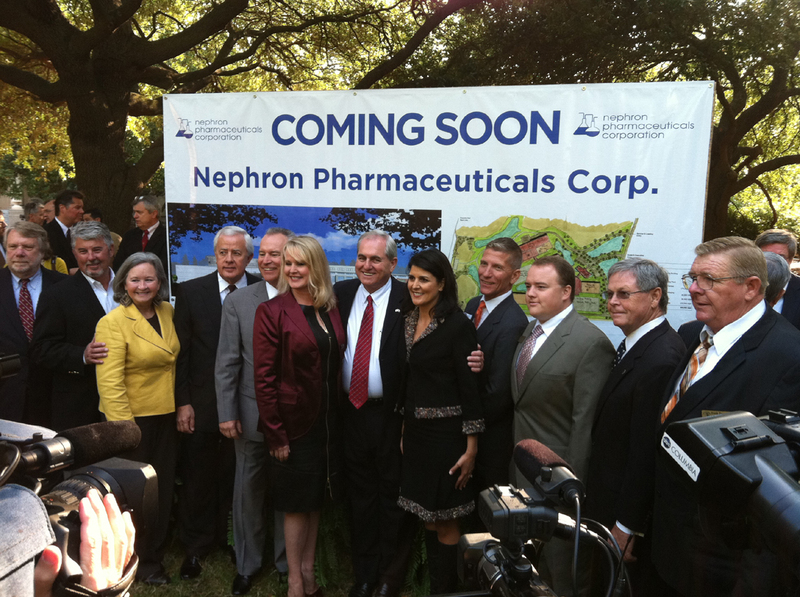 “Nephron Pharmaceuticals’ investment and new jobs will have a huge positive impact on our state. This new facility will be a major boost for our pharmaceutical manufacturing sector. Today’s announcement is the largest one in the state’s life sciences industry this year,” said Bobby Hitt, Secretary of Commerce. The new facility will be located on a 60-acre parcel of land near the Amazon facility in Lexington. It is expected to be up and running in the next couple of years. renowned leader in its field, and through the years has grown to manufacture over one billion units of medication. What an accomplishment,” said Lexington County Council Chairman Jim Kinard. 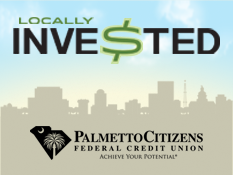 The S.C. Department of Commerce has committed a set aside grant of $4.5 million for site preparation and infrastructure. The company was also approved for job development credits, which will be available when hiring targets are met. The company will receive training support from the state’s ReadySCprogram. Nephron Pharmaceuticals Corporation is a global leader in manufacturing generic respiratory medications. The company’s products are available to retail pharmacies, hospitals, home care companies, long term care facilities, mail order pharmacies, and various other customers. For more information about Nephron Pharmaceuticals Corporation, please visit www.nephronpharm.com. As South Carolina’s leading economic development agency, the Department of Commerce works to recruit new businesses and help existing businesses grow. This year, Commerce won the Gold Shovel Award and the Deal of Year Award from Area Development magazine. Commerce has been part of recruiting world-class companies to South Carolina such as Boeing, Bridgestone, Continental, Monster.com, Heinz, ZF Group, BMW and Google Inc. Commerce also supports small and existing business, rural development initiatives and offers grants for community development. For more information, visit www.SCcommerce.com. This was a big day for all concerned, as you can tell from the basic facts, but the pics below will help confirm. Everybody wanted to get in on the act — the governor, Harris Pastides and a large array of USC honchos, Lexington County Council, the Lexington legislative delegation, Steve Benjamin and his folks, and of course the whole economic development community, from Commerce Secretary Bobby Hitt (who was sort of the master of ceremonies) through all the local and regional recruiters. 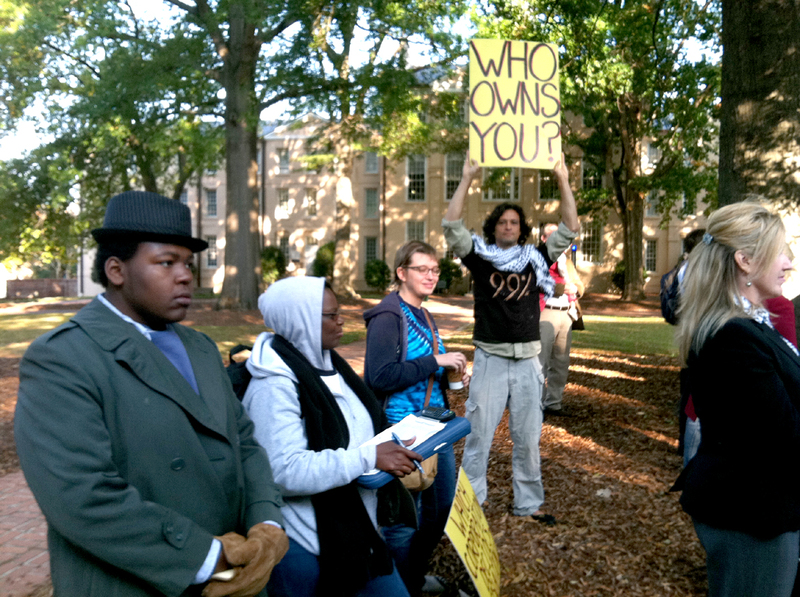 Walid Hakim and others from Occupy Columbia were there, which really confirmed what a big deal it was. There was enough glory to go around for all, especially for USC. Hence the Horseshoe venue. Lou and Bill Kennedy got their start at USC, and they have a child who is a freshman at the university. More to the point, they had already set up the Kennedy Pharmacy Innovation Center as part of Innovista. This is what Innovista is to look like, folks. Not White Elephant parking garages, but industries getting a foothold here through a research relationship with the university, then expanding into good jobs for South Carolinians. After the formal ceremony, Lou Kennedy said the jobs they’ve produced in Orlando pay an average of about $70,000. And at this point, they don’t plan on bringing any of their Orlando personnel here. So, very good news. And very little controversy — so far. House Majority Leader Kenny Bingham was given a chance to compare this to the fight Lexington County lawmakers had with the governor over Amazon (which will be this plant’s neighbor), and he declined. This one was nothing but cooperation. Part of that may be that the industry itself wanted to come here, rather than having to be enticed. (There apparently were incentives, but no one — aside from those involved in the deal — knows what they were yet. I ran into my friend Kevin Dietrich of The Nerve, the scourge of incentives, there, and he didn’t seem on the scent of any yet.) But whatever the reason they’re here. And I don’t feel like I’m going out on a limb when I say that’s a very good thing. Congratulations to all involved, from the governor on down. Lou and William Kennedy being interviewed after the announcement. 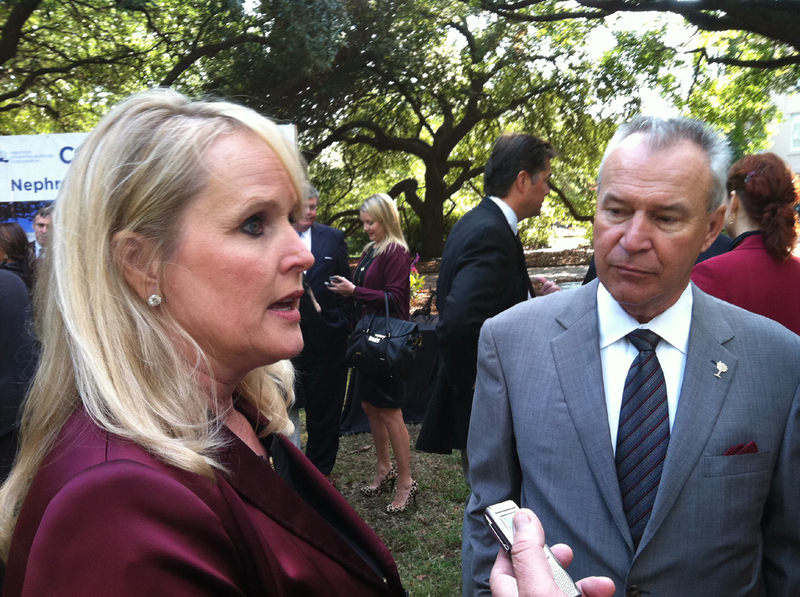 That’s USC lobbyist Trey Walker in the background. 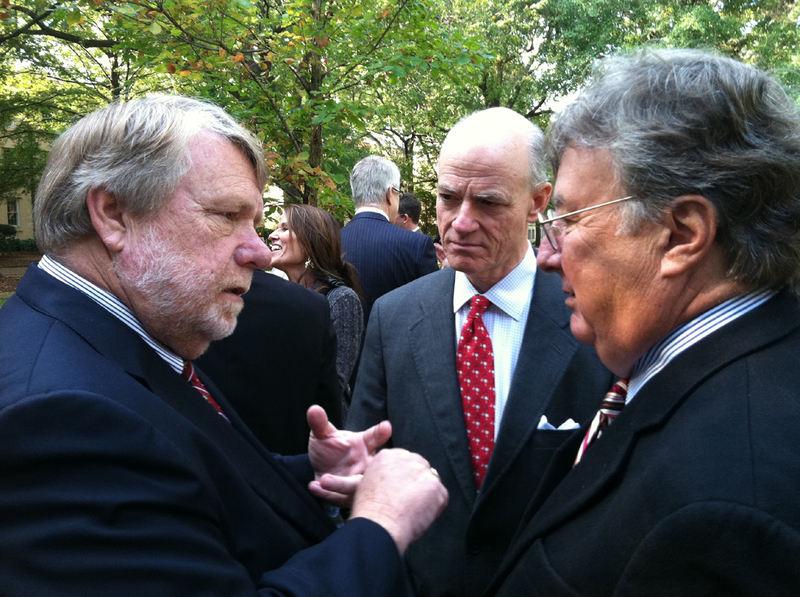 Bobby Hitt, William Hubbard, and Bud Ferillo. Sen. Nikki Setzler and Rep. Kenny Bingham, both of Lexington, being interviewed by SC Radio Network. 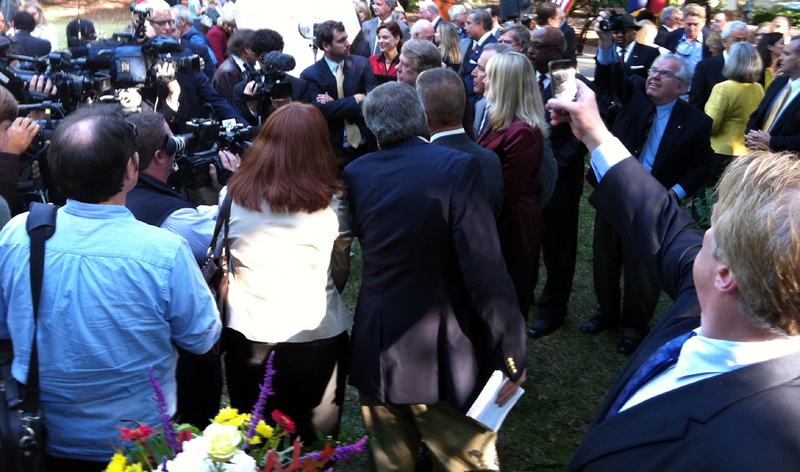 More media mobbing. Even Rep. Rick Quinn, bottom right, gets in on it. After the money shot. I like to get candids. When I noticed a TV camera shooting the sign (not the one you see, another one), I shot it, too. The governor has her turn, as Lexington County Councilman Jim Kinard (seated behind Hitt and Pastides) leans forward to listen. Nephron CEO Lou Kennedy addresses the assemblage. That’s Dave King sitting next to Steve Benjamin in the foreground. The announcement is made. That’s Bobby Hitt at the lectern in the distance, and Kevin Dietrich (white shirt) in the foreground. This entry was posted in Business, Community, EcoDevo, Higher education, Leadership, Legislature, Midlands, Nikki Haley, Say something nice, South Carolina on October 28, 2011 by Brad Warthen. 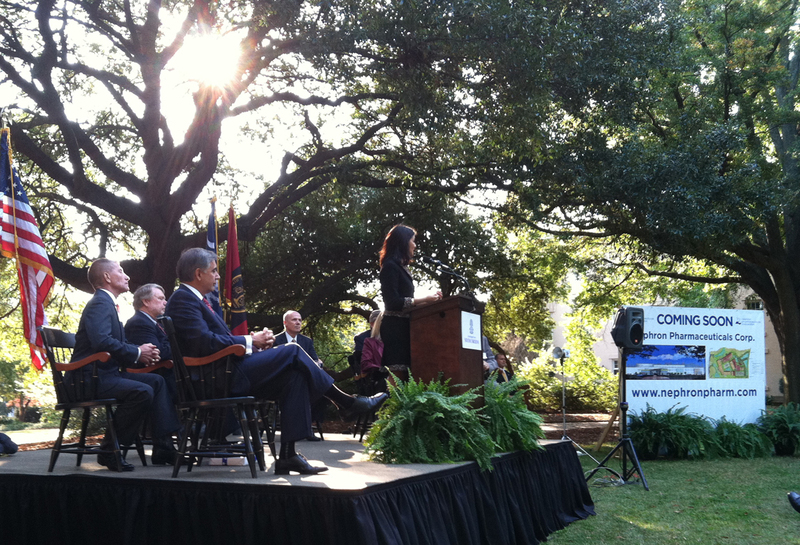 “The mission of Innovista is to create, grow and attract knowledge-economy jobs in South Carolina. By forming strategic partnerships with businesses, the University’s vast talent pool and world class resources can be a source for competitive opportunities and create value. “Today we are gratified to see the Innovista mission in action and moving forward with vigor. Our wonderful relationship with the Kennedys is in fact the full circle to the Innovista economic development strategy. Their gift to establish the Kennedy Pharmacy Innovation Center will create jobs in our state through innovation and entrepreneurship in the Pharmacy profession. Now Nephron Pharmaceuticals brings advanced manufacturing and many high-paid jobs to our area. As recently as July, Lou Kennedy, co-owner and CEO of Nephron Pharmaceuticals, was planning a $313 million manufacturing and research campus to be located at the generic drug maker’s Orlando, Fla., location. But in a moment of piqué with Florida regulators, she turned to a friend and former classmate, Sam Konduros of Greenville, for advice. In an interview this morning following the announcement, Lou Kennedy said she aims to get started on the facility right away. She said she does not yet have a general contractor, but will soon take care of that detail. The decision to locate the new facility in Lexington County has moved rapidly. Lou Kennedy and her husband, co-owner William Kennedy, have a complete plant design by Orlando architects and engineers for the Orlando site. Last summer, they were also considering a site in Murray, Ky., where they already have a distribution facility. But her contact with Konduros, and a later conversation with Gov. Nikki Haley, who urged Kennedy to rethink the location and put it in South Carolina, changed their direction quickly. “We weren’t even thinking about South Carolina last summer,” she said. Now they aim to adapt that design to the Lexington County site. She has already had a site engineering work done by a Columbia firm, Alliance Consulting Engineers. The Kennedys are from South Carolina. She is from Lexington County; he is from the Upstate. By the way, if you want to get a negative spin on this, you can go to our friend Will (complete with the proverbial airplane ride without which no conspiracy theory is complete) or wait until The Nerve (Kevin Dietrich’s publication) posts something complaining about incentives that were provided by the state. Right now, no one knows what sort of incentives were provided to make this deal happen. When we DO see the incentives, we can pick them apart and see what we think. Today, I’m happy for the community for getting this shot in the arm, and for the people who will get these jobs. I like to see our community doing well. Nice that the Innovista crew can rewrite history. Pretend the empty buildings don’t exist… Pretend there was no push for a hydrogen economy. Also funny how any good news gets all the politicians jumping on board. Then when something goes wrong they scurry like cockroaches. Doug, why can’t you be happy that 700 of your neighbors are going to have good jobs? Seriously, in terms of what this means to helping our community pull out of this horrible economic situation, what impact does ANYTHING that happened in the past have to do with it. When something good happens, why do you have to try to rain on it by talking about something you didn’t like in the past? Or worry about something that you think could happen in the future? Why can’t you be happy for the good news now, and happy for other people who are pleased by it? You know what, this COULD turn out to be a bad deal in the end. The company could collapse, and we might not get all of our investment back from whatever incentives were granted. Yep, could happen. You know why? It’s not because all politicians are EVIL, as you seem to believe. Because the private sector is based on capitalism, and risk is an inextricable element in that. Yeah, I get it — you don’t want the government participating in that risk factor. I understand. But government is about providing infrastructure and other conditions in which free people can thrive, and I for one want to see the Kennedys taking a chance on South Carolina, rather than taking incentives from some other community, some other state, that maybe doesn’t need these jobs as badly as we do. You hit the nail on the head. This COULD be a good thing. Why don’t we hold off on all the celebrations, back-slapping, and self-congratulations until, you know, an actual job is created? How is this different from the whole hydrogen economy fanfare when Innovista was announced? Lots of people got on that green-powered bandwagon back then, right? And where are all those people now ($100 million dollars down the drain later). It’s typical political rah-rah b.s. Celebrate an idea, take credit upfront, then disappear when results don’t match the fantasy. I’ll congratulate everyone when the facility actually opens and employs a few hundred $70K jobs. But that’s me… I live in reality world, not idealism city. No, Doug, this IS reality. This is how human beings operate. They NEED to celebrate, to be encouraged to keep going. And the natural — and smart — time to celebrate is at the outset. People celebrate at weddings; they don’t wait a few years to see if the marriage will work out. The celebration itself is the cementing of a bond, tying a lot of people to the enterprise, and giving it a greater chance of succeeding. We’re now past the 20-year mark on BMW, and we know it’s been a great success for South Carolina, having fulfilled and surpassed all hopes. So should we have waited to celebrate now — after Carroll Campbell is dead, as well as others who made it happen? That makes no sense. There is nothing B.S. about this. Nothing at all. It’s sincere and heartfelt. People are happy about this, and they are celebrating. Clicking the link brings you (I kid you not) a story from Midlands Business Journal about a company hiring a summer intern from USC to serve as ” filling the role of office administrator and inside sales assistant”. Not sure that’s going to help the ROI on Innovista. That may be the most egregious example of a headline overstating a news story that I have ever seen. Innovista is not about those buildings. I curse the day those buildings were conceived because they distracted everyone from what the Innovista concept is. It’s about all sorts of investments that will take place in all sorts of physical locations, mostly centered in an area bounded by the new baseball field and the State Museum along the river, and then up to Assembly Street — but NOT limited by that. It’s about leveraging that proximity to the University to promote high-tech development throughout the Midlands. Some will locate in the Innovista proper; some won’t. As Innovista succeeds, many large and small investors will invest in all sorts of ways in infrastructure — from existing buildings to new. And the types of investors will include living space, restaurants and retail stores for the people who work in the research-related businesses there. That’s IF it succeeds. Which is hard to do when so many people spit on the ground every time it’s name gets mentioned. This IS a case of Innovista succeeding, by the way — one step in the right direction. A business first got involved with USC through Innovista, and is now expanding its business in our area, producing jobs that pay well. This is one of a number of ways that one would expect Innovista to contribute to our economy. The nice thing about these celebrations is you get to eat the cake now and when things don’t work out well later on, you can complain about the cook. It’s good news. But let’s celebrate when the doors open, okay? We don’t have to wait 20 years. Just celebrate on day one when those 700 (or even 100) employees show up for work. So far, Innovista has been like a Kim Kardashian wedding. Everyone loves the party and then when she divorces a year later, the guests all wonder why they spent so much on a wedding gift. Well, I suspect there’ll be a celebration then, too. I look forward to it. And until then, I’ll be glad that we agree that it’s good news. Innovista created its own failed image. And it is about the buildings. It is about a grand plan funded with tax dollars by people who wanted all the glory with no risk. It’s about accountability for wasting a very large sum of money. People in private industries would lose careers over this level of mismanagement. It’s about the power of hype over performance. It’s about credibility. I’ve looked at the website over the years. I’ve dug deeper into the reality over the marketing b.s. Your vision of Innovista is not what was sold to the public. So what difference does it make what you think Innovista is/was? Yeah Doug. Innovation and business never involves taking a risk. If change only occurred when success is gauranteed, we’d still be celebrating fire or the wheel. Huh? Where did I make any claim that innovation didn’t require risk? The problem is when government officials take a risk with other people’s money and have no accountability. Give me $100 million and if I fail in creating 1000 jobs, I’ll quit and say I failed. Can you name one person who accepts the blame for Innovista’s financial failures? If I misunderstand, sorry. “Actual job” sounds like you want a guarantee. No, an “actual job” is a actual job, not an expectation of a job somewhere in the future. I could find you a bunch of Innovista press releases talking about all sorts of future jobs that never happened. How many of the attendees at this party would bet $1000 that those 700 jobs @$70K will exist in two years? Bet you’d see an empty platform if they had to put their money where their mouth is. Throughout the Great Recession, many press releases made beforehand proved to have been overly optimistic. “Overly optimistic”? How about “completely wrong”? How many net jobs has Innovista created as of today after spending over $100 million dollars? Aside from the people working FOR Innovista writing press releases about the hiring of a summer intern as a sign of the USC connection? This is one of those debacles where people on one side of the issue just want to pretend it doesn’t exist. This is not an announcement of a summer intern. And there is a definite USC connection — several, in fact. @Doug–These announcements weren’t fabricated out of whole cloth–there were actual bases for making them, which subsequently fell through. I’ll save you the trouble. Collexis was sold to another company (Elsevier) over 15 months ago. A check on Elsevier site location page doesn’t list any offices in South Carolina. but it is all in Italian and I can find no reference to Innovista since 2007. The fact that these companies are still listed as tenants is either a case of gross incompentence or gross negligence… or both. You’re both right: the bricks and mortar Innovista was a reasonable idea executed as only beaurocrats could do – that is to say it was an unmitigated disaster from the get go; however, this announcement last week was the real deal that should rightly be trumpeted and leveraged as the real Innovista for the future. It’s got to be about supporting private enterprise and providing the quality of life to attract job creators to our region. Well, I just had another enlightening conversation with Ann Marie Stieritz,who was brought in a few months ago as a liaison/marketer/”face” for Innovista, and I continue to be amazed at her vision and executive skills. I believe Innovista will work in the end. Until I raised holy heck this afternoon, the Columbia website had the un-redacted incident report from the Carter Strange beating up as an exhibit–complete with names, addresses and phone numbers of all involved including the victim and the juveniles. Websites are so often poorly supervised….I think it may be that outside the commercial realm, and really high end stuff, most managers who are our age or older, don’t think about the Internet much. Sorry, no dice. The website has been updated enough times with new information that leaving the old stuff there can’t be seen as just some clerical error. It’s pretty apparent to me that USC/Innovista has no interest in bad news or the truth. If they weren’t spending public dollars, I wouldn’t care what b.s. they attempted to push out there. Do you really care about their website and its press releases? Everyone can see that the original plan for Innovista was a non-starter. Isn’t it a positive thing, at least, that USC has learned and is moving on with the kind of vision that actually makes sense? I have the feeling that this new approach will lead to many new careers, investments and business opportunities. I need to quibble with your terminology, Mark — the “original plan” for Innovista was the one I always talk about. It’s a movement, an ongoing process involving thousands of players — researchers, technicians, production workers, merchants who provide goods and services to them — deciding to locate in this incomparable urban setting between a historic research university campus and that rare thing, an undeveloped riverfront, to live and work and play in a totally walkable environment. That’s what was pitched to me from the outset, and I’ve believed in that vision ever since, and continue to do so. Somewhere along the way, when the economy was doing a lot better, someone decided to try to accelerate the process by setting up these buildings as a sort of incubator space for research projects to get a foothold before expanding out on their own into the Innovista and surrounding area. At least, I think that’s what they were thinking. In any case, the economy crashed just as the buildings came online, and no one was inclined to invest in much of anything. What happened, and will happen in the future, with regard to those buildings, and however much money they will cost, is immaterial as to whether the Innovista is a good, viable idea that can transform our local economy. All the factors that were in place when we started talking about it are there now. Aside from the economy still being in the dump, the ONLY thing standing in the way of the ACTUAL Innovista is this situation in which people identify it with those buildings, and decide to have a rotten attitude toward the real Innovista because of them. THAT can certainly kill the vision and all of its potential. But there’s no rational reason for that to happen. It’s certainly not in the community’s self interest for it to happen. Because to the extent that that DOES happen, the rising tide may come, but we will have drilled holes below the water lines of all of our boats. So Brad, you’re saying if you have a vision the first thing to do is not spend $100 million taxpayer dollars on buildings. The Innovista is terminally ill, and I am willing to bet that it’s turn fatal before we see any kind of miraculous recovery. To have any kind of recovery will at minimum require the project be renamed. Are you saying they don’t matter? That USC should not be held to a minimum standard of accuracy when presenting information? Those two companies mentioned on the website are not, were not, and will not be creating new jobs at Innovista. That information presents a picture of Innovista that is untrue. I guarantee you that the website will be updated IMMEDIATELY when an actual job is created. But the “positive misinformation” lingers on for years. It demonstrates an attitude – one that Brad admires – it’s not what you do, it’s what you say you will do. Steven, I like to think I wouldn’t do that. But then, it’s hard for me to remember what things were like when there was money to be had. At this point, I certainly see it as a mistake. I just always hesitate to look at people who have made a mistake and say “I would never have done that.” I just like to think I wouldn’t have. And Doug, that is a gross distortion of what I believe and admire. What we saw Friday was a case of Innovista doing what it said it would do. And THAT I appreciate. Untrue. What stands in the way of Innovista is getting the right people who know how to create jobs to work for Innovista. No matter how much hype you give it, linking pretty much every new job from hot dog vendor on up to the power of Innovista’s amazing resources, it still comes down to people with business acumen willing to risk capital. Kathryn suggested you get new lenses for your eyeglasses recently. Maybe go for a set with slightly less rose coloring. @ Doug–leaving up old information can easily be a clerical error. The new stuff gets put up, and in the absence of the sort of copy-editing skills that my family excels in, the old stuff gets ignored. So what’s your opinion on having one empty building, then deciding that it’d help bring clients in if you build a parking garage and another office building? Then decide to stop construction on the third when they realized people were going to start asking questions when they realized the only people making money were construction companies. Didn’t Rick Kelly have something to do with this before he got canned from USC? Innovista will go down in history has the two most expensive buildings per square foot the taxpayers built for USC office space. Rick Kelly retired in the normal course. Did you look at the website? It’s not like this information is buried somewhere. It’s the first freakin’ paragraph on the page that lists the tenants (real and imagined) in the Innovista buildings. If nobody is looking at the information to see if it is accurate, that’s pretty sad. It would take 30 seconds to fix it if they really wanted to. Now that you have informed your contact at Innovista, let’s see how long it takes to correct. In my mind, right or wrong, Innovista is just following a model practiced by most major research Universities, having a place for technological research to spin off into start-up businesses and to benefit established businesses. A good example is the Triangle Research Park (RTP). RTP has three major universities (Duke, North Carolina State and the University of North Carolina) from which to draw resources, and that concentration of intellect surely helped establish the concept (in 1959). Often it takes time for vision to reflect reality, just as it did for RTP. It’s too bad Innovista mirroed that model so late, but I do the beleive the model works, and so will Innovista in the next 20 years.